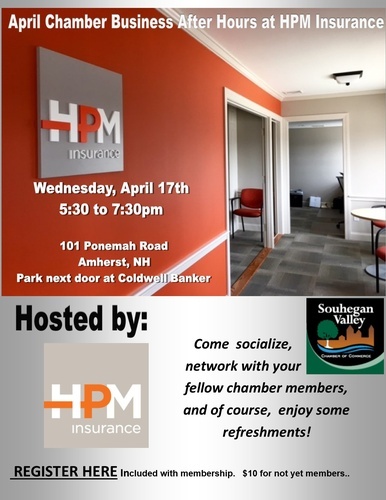 Come network with fellow Chamber members at the HPM Insurance in Amherst! Hey Chamber members, register online on or before April 15th for a chance to win a free "Member Spotlight" in the Chamber e-newsletter! Included with membership for current SVCC members. SVCC Members are welcome to bring a not-yet member courtesy guest who is interested in Chamber membership! Guests should be pre-registered prior to the event and come with the member. All guests must be accompanied by a member. Members: if guests join the Chamber, you receive $50 off YOUR membership!